GENEVA, Switzerland, April 18, 2016 – The UN High Commissioner for Human Rights Zeid Ra’ad Al Hussein warned Monday of “a sharp increase in the use of torture and ill-treatment in Burundi” and voiced concerns about worrying reports of the existence of illegal detention facilities, both in Bujumbura and in the countryside. “Since the beginning of the year, my team has recorded at least 345 new cases of torture and ill-treatment. These shocking figures are a clear indicator of the widespread and growing use of torture and ill-treatment by government security forces,” said Zeid. In all, some 595 people have been ill-treated or tortured since April 2015, a figure which is likely to be an under-estimate. “Torture and ill-treatment mainly take place at the time of arrest, upon arrival or during detention, especially in facilities run by the Service national de renseignements (SNR), the police and, to a lesser extent, the army. Perpetrators of torture and ill-treatment have so far enjoyed total impunity,” the High Commissioner said. “Many detainees visited by our team in the past few weeks had fresh wounds on their bodies. Some were unable to walk without assistance after being beaten with belts, iron rods or sharp objects, or burned. I am profoundly disturbed by these terrible accounts and I urge the Burundian Government, in the strongest terms possible, to put an immediate end to these unacceptable and illegal practices,” said Zeid. Most of the tortured and ill-treated detainees say they were denied medical treatment. Some said intelligence services hid them in the toilets for days so their torture wounds could heal before they were returned to cells holding other prisoners. During a visit by a UN human rights team to SNR facilities in Bujumbura last week, 30 of the 67 people held there displayed physical signs of torture. Many irregularities were identified during the visit, including the fact that 25 of the detainees had been kept in custody beyond the prescribed maximum time limit. In addition, while all detainees had been arrested for what were reportedly minor offences, the accusations entered against many of them in the SNR registry were for much more serious criminal offences, including undermining State security, illegal possession of arms and espionage. Several cases of ill-treatment and torture have also been reported at police stations, especially in those located in the two Bujumbura neighbourhoods of Citiboke and Musaga, and at the Mutakura military camp. The High Commissioner noted that the use of torture and ill-treatment was also widespread in the countryside, noting a case of two men who said they were arrested by SNR agents in Nkamba province at the end of March. They said they were seriously beaten and repeatedly dropped in Lake Tanganyika with their hands tied on several occasions in order to force them to confess to crimes. “I recognize the efforts made by the Government in releasing at least 45 demonstrators following the Secretary-General’s visit. However, in addition to the reports of torture and ill-treatment in official detention facilities, I am deeply concerned about information emerging about the existence of secret detention facilities across the country,” the High Commissioner said. A man who was arrested at the end of March by unidentified armed individuals stated that he was taken blindfolded to an unfinished building in an unknown location, where nine other people were also being held. The victim reported witnessing the execution of two fellow detainees before he managed to escape. Reports have also been received of another illegal detention facility, allegedly set up by the police with the support of the Imbonerakure militia, in the city of Ngozi, in the northern part of the country. The High Commissioner said he had also received “persistent reports of arrest, detention, torture, ill-treatment, enforced disappearances and assassination of certain members of the police and military by other government forces.” Members and officers of the former Burundian Armed Forces – known as ex-FAB and which was predominantly Tutsi – appear to have been particularly targeted, including some retired soldiers. Many soldiers interviewed by the UN Human Rights Office while in detention said that the torture or ill-treatment they endured was aimed at forcing them to confess their support for rebel groups or to provide names of other people suspected of supporting them. Some soldiers detained at the SNR facilities claimed to have witnessed the killing of a number of their colleagues. On 10 April 2016, the body of an ex-FAB soldier, who had been arrested the previous day by the police, was found in Gesenyi, near Citiboke. At least five soldiers have also been reported missing following their arrest by police or military forces over the last few weeks. Zeid also deplored the increase in attacks by unidentified armed men, reportedly linked to rebel groups. At least 30 attacks in Bujumbura and in several provinces took place in March, killing one civilian and four soldiers. Around five civilians were also reportedly killed during a rebel attack near the Tanzanian border on 11 April. The High Commissioner also condemned the targeting of members of the ruling party, the CNDD-FDD, including the assassination of a local official and member of the CNDD-FDD who was shot at his home by unidentified armed men on 13 April in the town of Kajaga, in Bujumbura Mairie province. There was released a report on torture of citizens in Burundi in recent year from CSO Amnesty the 24th of August. This here has been described I will take the defining characters of this from that report, but also some older documentation to prove that this isn’t new actions from the Governmental and Security organizations in Burundi. In 2006 the Committee from International Service from Human Rights commented on the torture matters already then. After that I will look on what numbers and anti-torture project where the purpose was: “Effectively build capacity for sustainable support to victims of torture; and prevent future incidences of torture”. And the projects are telling from the USAID in the same period. USAID had also a monitoring period that ended in 2007 that gives some interesting insights to the methods of torture. United Nations has made a review of the situation when it comes to torture as well in 2014. So that Amnesty International is telling stories that everybody who cares about Human Rights should read all of the personal stories. I have taken the big picture from the report that was delivered from the organization on the 24th of August 2015. Which also shows to the works of the UN and OHCHR and describing the matters and sadness of how the police and other units treats its citizens who demonstrate against the government. It should be stopped and international community should do something about it. Though it’s an issue that is continuation from 2006 and I am sure earlier then that while in war, an CNDD-FDD promised to lead with the USAID projects to shun this activities, but certainly hasn’t with the reports released recently. Read under the quotes and outtakes from a set of reports and some of the pieces from Amnesty. “The Committee criticised the lack of a definition of torture in Burundian domestic legislation. The delegation admitted that while Burundi officially endorses the definition contained in the Convention, their criminal code does not define torture, nor is torture as such criminalised. In practice, torture is treated as an ‘aggravating circumstance’ and pursued on the basis of ‘infliction of bodily harm’” (…)”Both country rapporteurs underlined that the legislation prohibiting torture must not only cover physical torture (which is the case as long as torture is prosecuted under the category of ‘bodily harm’), but needs to extend to psychological and mental torture. The Committee drew the delegation’s attention to the obligation States have to initiate investigations into cases of torture. Mr Camara said that given the lack of a domestic legal basis, prosecutors in Burundi did not have a clear incentive to investigate cases of torture” (…)”the National Intelligence Service (NIS). It is responsible for the collection of date in order to protect the state security of Burundi. It can also carry out police functions and arrest people. According to the State report, the NIS is one of the main institutions involved in cases of torture. The Committee repeatedly expressed concern about this situation. Mr Mariño said the NIS seemed to have a dual mandate and be responsible for political oppression; it needed to be reformed, monitored and made accountable to the judiciary. Mr Camara asked if NIS officers could be sanctioned by the PPS; the delegation confirmed this with reference to ongoing cases. The delegation agreed that the NIS had too many prerogatives and specifically asked for recommendations on how to curb its power” (…)”In reference to the prohibition of the use of evidence obtained through torture, the delegation referred to a supreme court judgement which prohibits such evidence from being used in court. However, a Committee member pointed out that this particular decision is ambiguous since it says that “a confession is not proof in itself, but merely a piece of evidence that must be corroborated by other evidence”. The Committee felt this could be construed so that evidence extracted through torture could be used if supported by other evidence (Human Rights Series, 2006). Turning to concrete cases, some Committee members asked about further information on a massacre which had taken place at Gatumba. The delegation responded by saying that it had issued a report which attributed the responsibility for the massacre to members of the armed movement PALIPEHUTU-FNL” (Human Rights Monitor Series, 2006). PURPOSE: Effectively build capacity for sustainable support to victims of torture; and prevent future incidences of torture” (Victims of Torture Fund, USAID, 2005-2006). Trauma healing: Eighteen Healing Memory Group activities (785 participants) held to provide psychological healing for victims. 372 victims of torture received psychological support and 567 received medical services; 289 referred to partners; 750 transported to medical facilities (Victims of Torture Fund, USAID, 2005-2006). USAID has continued to follow up the country and reports on Torture between October 2007 – September 2011. Here is their findings and what they have received of information on the matter: “Human rights. The project worked to strengthen the institutional capacity of civil society organizations, particularly those focused on women, to advocate for gender-based violence, victims of torture, and conflict management. By launching campaigns and engaging in effective discourse with the government and the media, civil society groups were able to open up about the sensitive and often dangerous nature of supporting human rights, which led to increased awareness and understanding” (…)”Victims of torture. In Burundi, torture continues to be practiced and victims have had little recourse because those in positions of authority, such as public security agents, presidential police, soldiers, local government officials, and rebel groups have all practiced torture without being held accountable for their actions. Through its activities, the project has been able to help Burundians open up a public dialogue and raise awareness about the problem of torture, a subject that over the years had become taboo in many parts of society” (…)”Victims of torture consortium. One organization cannot influence change alone, and working in the anti-corruption or human rights arena can be dangerous. Thus to strengthen advocacy against torture in Burundi, the project convened civil society organizations working in human rights and torture to start a dialogue on what is needed in this area and propose the idea of creating a consortium. The project worked via the consortium structure to coordinate these various and extensive activities. At subsequent meetings, the number of civil society organizations more than doubled and by the time the consortium, Consortium Action Contre la Torture (CACT), was incorporated it represented most of Burundian civil society working in human rights, with 26 organizations and government entities. The consortium, designed to coordinate advocacy for the eradication of torture in Burundi, identified priorities for reform when the consortium was first formed” (…)”Victims of torture grants. The project allocated 18 grants to civil society organizations in Year 2; eight of them provided medical and legal assistance to 453 victims of torture. The project provided medical, psychosocial healing, and legal and judicial assistance. The grants were provided to organizations with previous experience in this area, and they were able to work in cooperation with other grantees as well as in the consortium against torture. The most pressing need for a victim of torture is medical assistance. Many victims are debilitated or prevented from working due to the injuries, and others live with the physical scars and residual pain. The assistance consisted of providing victims medicine, hospitalization, and specialized care. Seven grantees provided medical assistance to victims in various provinces. One example of the medical services provided by grantees is the work done by ACAT, an organization that carried out medical services in 26 communes” (…)”In addition to being physically traumatic, torture is also emotionally and psychologically traumatic. Even if physical scars heal, there are lasting psychological effects. The project created a support group that fostered an atmosphere of empathy, affection, and security that victims greatly appreciated — especially significant because most victims never dared to speak about their experiences” (…)”In Year 4, project grantee ABDP-DRS advocated for the use of alternative sentencing to imprisonment in accordance with a law of 2009. By meeting with decision-makers, including prison authorities, police, and judges to present data from a survey, ABDP-DRS was able to provide information on alternative sentencing. It also organized prison visits so that police and judges could see the current conditions of the prisons to which they were sentencing perpetrators. Action Chrétien Contre la Torture (ACAT) also received a grant to continue advocating decision-makers and judiciary actors. 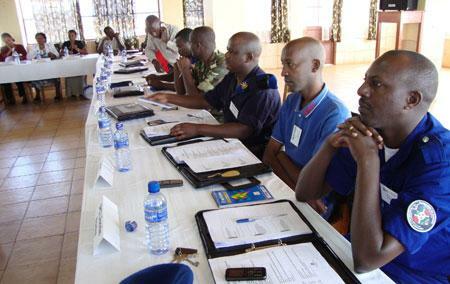 ACAT equipped judges, judiciary police, and prison officers with information gained during site visits of detention centers in 11 provinces to evaluate the torture cases, living conditions for detainees, and the application of the penal code regarding torture” (Burundi Policy Final Reform, 2007). While noting that an absolute prohibition of torture is established in the Constitution, the Committee is concerned at the numerous shortcomings of the organization and command structure of the country’s security services, particularly the Burundian National Police (Police nationale du Burundi) and the National Intelligence Service (Service national de renseignement). These services are still governed by presidential decrees, whereas the Constitution provides that they be governed by the necessary legal framework. While noting that article 31 of the State party’s Criminal Code establishes that an order from a superior officer cannot be used as an argument by the defence in a case of torture, the Committee remains concerned about the effective implementation of that provision (arts. 2, 6 and 16)” (United Nations, 2014). “The absolute prohibition of torture” (…)”The State party should, as a matter of urgency, take steps to incorporate provisions into its Military Criminal Code that establish that acts of torture and ill-treatment committed by military personnel constitute an offence, that such offences are not subject to any statute of limitations and that the sentences for such offences are irreducible. The provisions to be incorporated into the Code should also establish appropriate penalties” (…) “The Committee is alarmed by credible, corroborative and persistent reports of a large number of acts of torture and extrajudicial killings committed by members of the Burundian National Police and the National Intelligence Service. It is concerned about the slow pace and limited scope of the investigations and judicial proceedings that have been opened in this connection, which would appear to corroborate claims that the perpetrators of these acts enjoy impunity. The Committee also finds it regrettable that no information about cases that have gone to trial or the outcome of those trials has been forthcoming. It is also concerned at the absence of protection for victims and witnesses, who are subject to reprisals (arts. 2, 4, 6, 7, 12 and 14)” (…)”The Committee is alarmed at the appalling conditions of detention in places of deprivation of liberty. It deplores, in particular: the high levels of prison overcrowding; the failure to separate male prisoners from female prisoners, adults from minors and persons awaiting trial from those already sentenced; the shortage of beds and sleeping space; the poor sanitary conditions; the dilapidated state of the facilities; prisoners’ inadequate and unbalanced diet; and the lack of health care. It further deplores the death of 263 inmates, inter-prisoner violence and the sexual violence against women and minors perpetrated by other inmates and guards. Lastly, the Committee is concerned about the continuing practice, in the State party, of detaining patients in hospital for non-payment of fees” (…)”While taking note of the fact that article 289 of the new Code of Criminal Procedure provides for the compensation of victims of torture, the Committee expresses its concern at the failure to apply this provision, in violation of article 14 of the Convention” (…) “The restrictions on the right of assembly and demonstration imposed by law enforcement bodies and reports of cases involving the violent suppression of demonstrations resulting in the excessive use of force by the authorities, for example during the protests of March 2014” (…)“The serious human rights violations perpetrated by a youth group (referred to as the Imbonerakure) with close ties to the Government, including: the harassment of political opponents; the disruption of public meetings, acts of intimidation, arbitrary arrests and arbitrary detention and other acts of violence; and the use of so-called “amicable” arrangements for settling disputes. The Committee is deeply concerned by reports that the Government is providing this group with weapons and training” (United Nations, 2014). “Both the SNR and the Burundian National Police (PNB) are responsible for torture and other ill-treatment. Former detainees described being beaten with branches, iron bars, and police batons; and being stomped on, threatened with death, denied medical care, and verbally abused. In one particularly horrific case, a five-litre container full of sand was hung from a man’s testicles, causing enormous pain and swelling, and then the man was made to sit in a shallow layer of what he believed was battery acid, burning his skin severely” (…) “In and after the demonstration in April 2015 this has happen: “The police response to the demonstrations was marked by a pattern of serious violations, including of the right to life, freedom of association and peaceful assembly. They used excessive and disproportionate force, including lethal force, against protesters, at times shooting unarmed demonstrators running away from them. 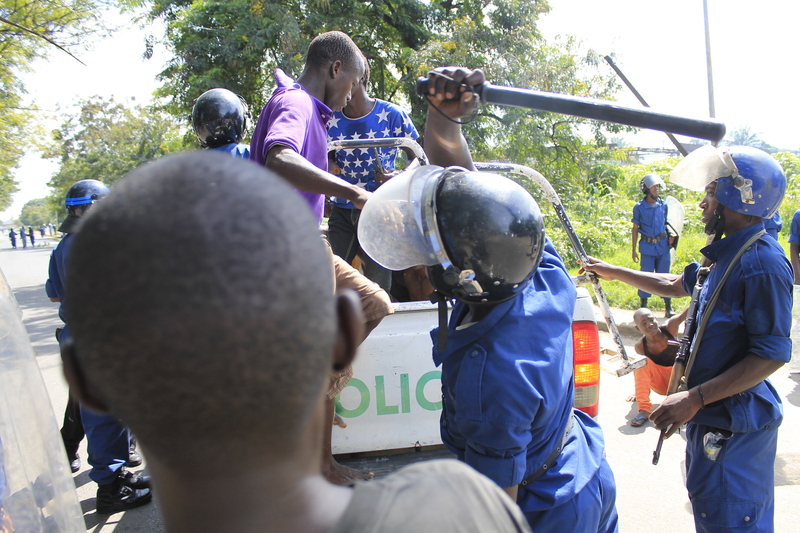 Even where children were present during demonstrations, police still failed to exercise restraint, and used tear gas and live ammunition” (…)”The cases of torture and other ill-treatment under SNR detention documented here all took place at the SNR compound near Bujumbura’s cathedral” (…)”In early June, the Office of the United Nations High Commissioner for Human Rights (OHCHR) in Burundi told Amnesty International they had documented nearly 50 cases of torture and other ill-treatment. On 7 July, the UN Secretary General’s report on the electoral observation mission in Burundi stated that “some 307 people have been arrested, including 14 minors. Most of those arrested have been subjected to torture and cruel, inhumane and degrading treatment by security officers (mainly police and intelligence agents)” (…)”According to information received from lawyers, when individuals previously held by the SNR have alleged torture before court, the evidence obtained under such circumstances did not appear to have been declared invalid in spite of clear provisions in the Burundian Code of Criminal Procedure. 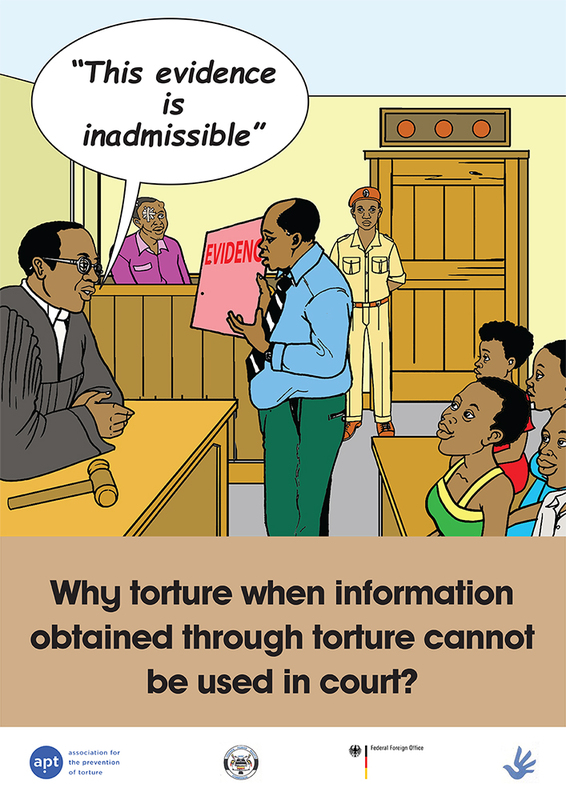 To date, there is no investigation and nobody has been arrested for torture at the SNR” (…) “However, the Burundian Code of Criminal Procedure makes provision for a detainee to remain silent if his lawyer is not present and for a detainee to communicate freely with his lawyer.16 A leading Burundian human rights organization, the Association for the Protection of Human Rights and Detained People (APRODH), is no longer granted access to the SNR’s compound. At least one detainee says that he signed a document under duress” (…)”A man held at the SNR was also told by other detainees that the Imbonerakure had given information to the police for their capture” (…)”several testimonies of torture and other ill-treatment at a place known as Chez Ndadaye in Bujumbura. According to a policeman and UN human rights monitors, Chez Ndadaye is an operational command centre for the police.36 It is known as Chez Ndadaye because the presidential palace that housed President Melchior Ndadaye, the country’s first democratically elected president and first Hutu president, once stood there” (…)”According to the first policeman and two victims, demonstrators were not kept overnight at Chez Ndadaye, but were beaten there before being transferred to the judicial police and/or police stations” (…)”The OHCHR carried out a planned visit to Chez Ndadaye on 12 June 2015, but did not observe any torture or beatings at the time” (…)”One policeman told Amnesty International some policemen are frustrated by the situation. He explained: “Several policemen are not happy about what takes place at Chez Ndadaye and have complained to their superiors. Most of the perpetrators are those who were previously in the bush (ex-FDD). They beat protestors. Maybe around 10 people came through Chez Ndadaye every day. Police used their batons and electric wires to beat them. 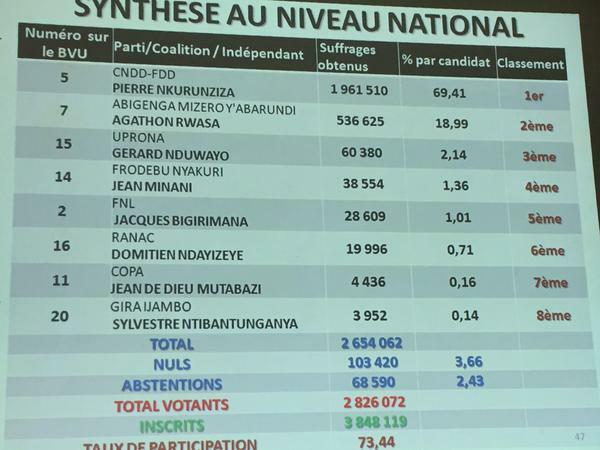 They’d say ‘you who are against Nkurunziza, you are wasting your time, he’ll be president forever’,” (Amnesty, 2015). I don’t really want to comment more on the issues. Because the reports on reports are really telling its own tale, I will not add much on it. Then it’s a sad story of real men and woman who is scared and hurt for their position in society. 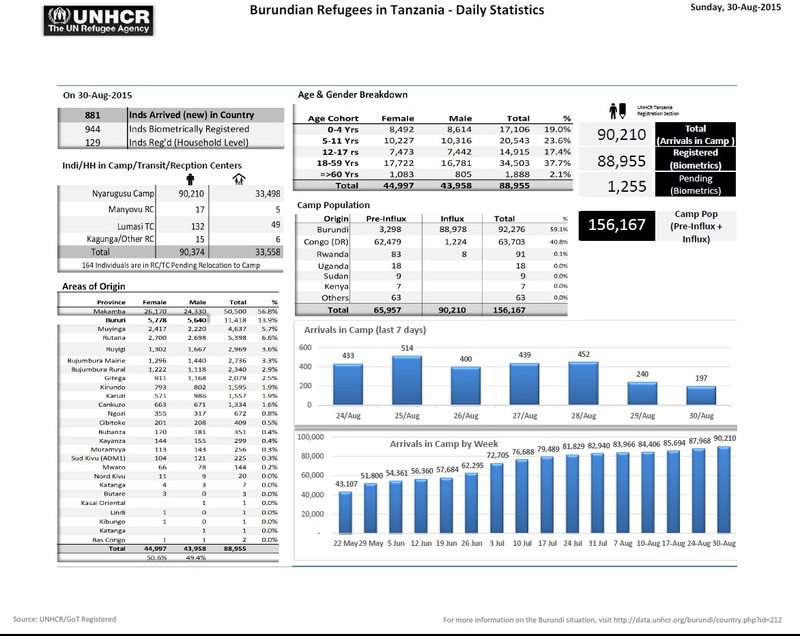 That the UN, USAID, OHCHR and Amnesty reports from 2006-2015 is telling a vivid stories and painful facts. Too many victims of the government and police of Burundi, they all deserve a voice, they all deserve justice and a society where this wouldn’t happen. Instead the Police and Government of Burundi is going after their own people without prosecution and trial. Putting them in shackles, pushing them in cells and hurting them in places like Chez Ndadaye in Bujumbura and that is not the only house and police institution that is being used in a vile place. So no matter what people are being unjustified threaten and punished by the police and security forces in Burundi. There should be something the world could do to stop this systematic and unjust ways. Not just in writing and councils reviews of the United Nations, but in actual forum that can change the President Pierre Nkurunziza of Burundi and the regime of the country. That is the issue and it’s not easy especially with the ways that the president got “elected” into the third term. Pierre Nkurunziza will always be remembered in a unique way and essentially with the shunned sworn-in celebration in mid-August 2015. An also for the reports of torture that the police and security organizations are doing as well in his presidency as well, which isn’t a beautiful view. Peace. USAID – ‘BURUNDI POLICY REFORM FINAL REPORT October 2007 – September 2011 (12.09.2011) – This publication was produced for review by the United States Agency for International Development. It was prepared by Chemonics International.